February 4, 2019 February 4, 2019 by Julie Gaston . Posted in " Uncategorized " . 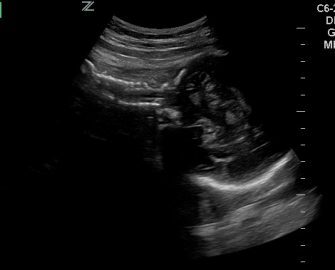 This patient returned for a follow up ultrasound exam (CPT 76815) for a low lying placenta identified on her 20 wk growth and anatomy scan. She is G3P2 and currently 30w3d. 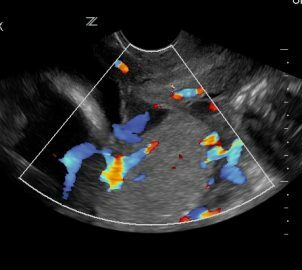 When performing a follow up ultrasound exam, it is always important to begin with fetal presentation. As we reviewed in class, when you know the fetal lie then you know how to manipulate your probe to find what you are looking for. Here you can see that the baby is in a cephalic presentation. The image above is a sagittal slice. Remember the notch is facing mom’s head and therefore the left side of the screen is superior (toward mom’s head) and the right side is inferior (toward mom’s feet). The next thing I do is look for a beating heart. 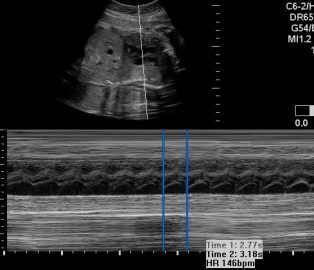 Establishing viability is a requirement anytime you perform an ultrasound on a pregnant woman. 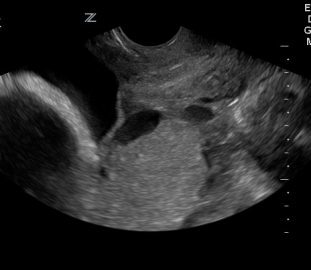 Even if it is a limited exam for previa or checking the fluid, you must confirm fetal viability. You can confirm viability multiple ways. You can use m-mode, pulse wave Doppler, or cine clip. It isn’t required to get a fetal heart rate, just confirm that the fetus is alive. The practitioner used PW Doppler and did get a fetal heart rate of 146 bpm. These next two images are of the posterior placenta. The reason for this exam is to follow up the low lying placenta that was identified on the anatomy scan. When evaluating the placenta, it is important to image it in two planes. The transverse plane will identify location. Note the image on the left. You can see that there is placenta above and below. That is because this placenta is posterior maternal right. The transverse plane will give you information on the location of the placenta within the uterus but the sagittal plane with tell you the location of the placenta in relation to the cervix. You can see a longitudinal slice of the cervix and the posterior placenta adjacent to it. The cervical canal is visible as well. 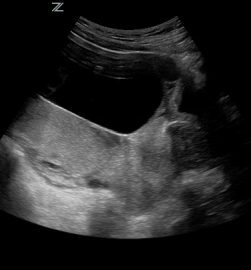 When measuring the cervix transabdominally, remember to have the bladder as empty as possible. This may seem counterintuitive because a full bladder helps us see better. However, a full bladder can artificially elongate the cervix. Here you can see an empty bladder and a long closed cervix measuring 4.2 cm. The most effective way to confirm a placenta previa is to look transvaginally. 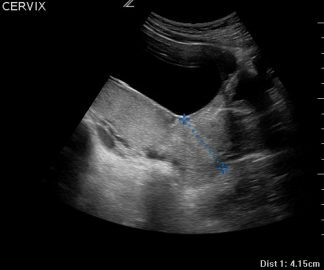 Below you will see images of a transvaginal approach. Below you will see a measurement from the edge of the placenta to the internal os. The bright echos to the left of the screen are the fetal skull. You can see that the measurement from the tip of the placenta to the internal os is only 6 mm. Historically, there have been three defined types of previa: complete, marginal and partial. Currently, these have been consolidated into two definitions: complete and marginal. A complete previa completely covers the internal os. A marginal previa is defined by distance of less than 2 cm from the internal os but not covering it. It is also critical to investigate for vasa previa. This dangerous condition can be identified with color Doppler. Place the color box over the internal os and make sure the gain is turn up enough to identify color. 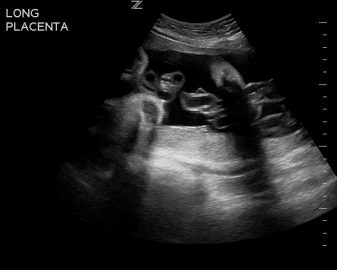 In closing, the best time to look for placenta location is during the growth and anatomy scan. During this time there is plenty of room to fully evaluate the placenta. 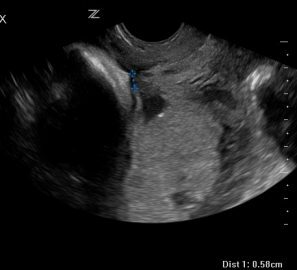 This exam will prompt you to either clear the placenta or schedule a follow up to evaluate if it is indeed covering the cervix or if it is low lying. 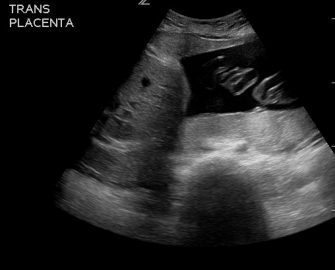 A posterior placenta can be challenging to evaluate in the third trimester. A transvaginal approach is the method of choice when a complete or marginal previa are suspected.